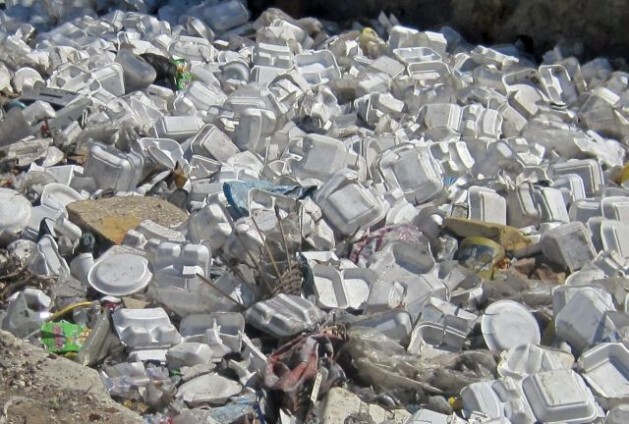 PORT-AU-PRINCE, Aug 16 2013 - Despite two government decrees making their import and usage illegal, styrofoam cups and plates are used and littered all over the capital, as well as bought and sold, wholesale and retail, completely out in the open. The first decree, dated Aug. 9, 2012, went into effect on Oct. 1, 2012, as part of a decree that also outlawed black plastic bags, used by street vendors as well as in greenhouses all over the country. Toussaint said he was also worried about the possible impact on agriculture, since many people and organisations sprout seeds in small black plastic bags. In spite of the obvious failure of the 2012 decree, the government of President Michel Martelly and Prime Minister Laurent Lamothe recently adopted a new one, dated Jul. 10, 2013 and written in much the same language. There is an “interdiction on producing, importing, commercializing, and using, in any form whatsoever, plastic bags and objects made of styrofoam for food purposes, such as trays, bottles, bags, cups, and plates,” according to the Jul. 10 issue of the government’s official journal of record, Le Moniteur. Quoted in Listin Diario earlier this month, Sandy Filpo, head of the Asociación de Comerciantes e Industriales de Santiago (Association of Santiago Businesses and Industries) said that Dominican products are made to international norms and accused the government of malfeasance. The government statistics agency puts the value of plastics exported to Haiti at 67.3 million dollars per year. If the last 10 months are any indication, there is little reason to think the new decree will bring about much change. The streets of the capital region are awash in styrofoam. Any passerby, police officer, or state official can see bright white products, as well as the illegal black plastic bags, being used and discarded everywhere. Plastic trash has been catastrophic for the environment. The capital region is drained by open canals that lead directly to the Caribbean Sea. In addition to clogging the canals and causing flooding in the poor neighbourhoods through which it passes, sea currents carry the trash all over the world. An investigation by HGW in downtown Port-au-Prince and the adjoining city of Pétion-ville in May and June 2013 found that almost all of the street-food vendors were using the illegal products. Downtown, on four streets studied, 28 of 28 vendors – 100 percent – used styrofoam dishes and cups. In six streets of Pétion-ville, journalists tallied 20 of 26 vendors – 77 percent – using the illegal products. A visit last week, after the new decree went into effect, revealed that nothing had changed. Two very popular Pétion-ville restaurants, Contigo Bar Resto Club and Mac Epi, were also using styrofoam products, both before and after Aug. 1. And many – perhaps even all – of the nearly a dozen franchises and restaurants of the popular Epi d’Or chain use styrofoam take-out containers. Many also use styrofoam cups and styrofoam plates for those “eating in”. On its website, Epi d’Or says it works “with strict respect for laws and for the public interest”. Asked via email why the chain has been using the products, which have been illegal for over 10 months, owner Thierry Attié responded that his outlets had replaced the cups but not the “clamshells”. However, HGW observed styrofoam cups in use at Epi d’Or’s Pétion-ville outlet on Aug. 9, the day of Attié’s message. Styrofoam products are also widely available wholesale. Of 11 food and general supply stores or stands visited in June and July, 10 openly sold the illegal products. On Aug. 5, five days after the new decree made them illegal for a second time, they were still on sale. A businesswoman supervising a team unloading merchandise from a truck at her Rue Rigaud store told HGW, as did at least two other businesspeople, that she bought her styrofoam products at SHODECOSA, one of the city’s industrial parks housing assembly industries which receives regular deliveries from the Dominican Republic in large, closed containers. SHODECOSA (Superior Housing Development Corporation S.A.) is the country’s biggest private industrial park. It belongs to the WIN Group, the conglomerate owned by the Mevs family, which also has interests in maritime transport, assembly industries, and ethanol. WIN also runs the country’s largest private port, TEVASA, in the Varreux area of Cité Soleil. “Ever since Lamothe became prime minister, I stopped going to the Haitian-Dominican border because only the bourgeois have the containers that are authorised to cross the border with merchandise,” the businesswoman claimed. A third said he buys at SHODECOSA and also buys them by the container at the border towns Elias Pinas and Malpasse. HGW did not speak with WIN Group about the allegations. However, the fact that various Pétion-Ville stores told matching stories about where they got their products indicates that during the 10 months of the first decree, and perhaps still, styrofoam plates, cups, and other items were for sale somewhere inside the park. To date, apart from a raid on small wholesalers in the poor neighbourhood of Marché Solomon on Aug. 12, no “steps” have been announced, nor have there been any major confiscations or arrests at places like Epi d’Or or the SHODECOSA industrial park. Restaurants, street sellers and others are still using styrofoam cups and plates that will eventually end up in ravines and canals. Another law meant to protect the environment makes tree-cutting illegal, but piles of planks cut from Haitian trees are for sale on city streets all over Haiti.